Sweet Jeanette: Fall. Are you kidding me??? Sure doesn't feel like fall, of course in Florida, neither does winter! This is the temperature at 11:23 , and that’s AM. Some of “the girls” decided to go to breakfast and then to SoHo (a.k.a. Southern Hospitality) in Plant City (FL). 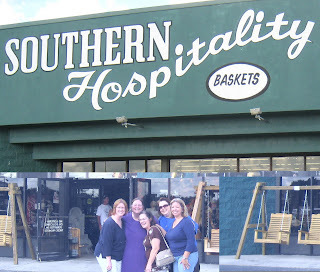 Since I’m dieting, I opted for just meeting the gang at Southern Hospitality. Not to be outdone, the husbands then decided to go to breakfast together too...at a different location. This is so sad, I am a Plant City girl, born at the hospital in Plant City, graduated Plant City High School, worked at the same hospital I was born in for years and what do I do when I’m out with the girls? Ask a stranger to take our picture in Plant City! I guess they know me by now because they didn’t bat an eye when I said, “hey, come over here for a shot by the Christmas trees”! They just followed orders. (My kind of friends) That’s me, Beverly and Sarah. The others were lost in the store somewhere. Oh, here they are! Power shoppers! I think Bev should invite us over to see her home decorated with all the nice fall things she got. That's Joyce and Lynn in the background. This was a fun morning. Thanks to Sarah for putting it all together for us. The husbands said they wanted to do this on a regular basis. I think we ladies could go for that! Next venture - The Barn and then Lavendar and Lace Tea Room??? Hmmmm.... I'm liking that idea! Stopping by from SITS!! Cute blog!! Hi Jeanette, thanks for looking at my blog today! I was thinking of doing a field trip to The Barn, too! I am still fumbling around with my blog-- trying to get it off the ground, define it, and do what I want it to do. See ya! Happy SITS Saturday Sharefest:) I am not too far from you in FL.. I even have some distant ex-relatives from Plant City:) Love your blog header- so cute! stopped in from SITS....looks like you had a lot of fun! the same here in italy... it's still sooo hot..
Amen SITSta I am in Tucson and if it doesn't cool down here soon I honestly think I am going to die! This has been the LONGEST summer EVER!